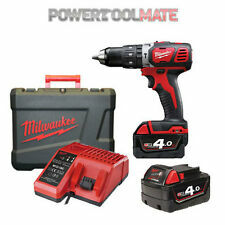 Milwaukee M18 BPD-402C Combi Drill 18V Charger and Case 2 x 4.0Ah Batteries The Milwaukee M18 BPD Combi Drill is compact at only 198mm in length, ideal for working in confined spaces and comes with two 4.0Ah Batteries, a M12-18C Charger and a Carry Case. Includes: ​ 2 x 4.0Ah batteries M12-18C Charger Carry case Bit Holder with double ended bit ​ Specifications: ​ No load speed gear 1: 0 - 450 rpm No load speed gear 2: 0 - 1800 rpm Max. torque: 60 Nm Voltage: 18V Battery pack capacity: 4.0 Ah Battery type: Li-ion Max. percussion rate: 0 - 28,800 bpm Charger supplied: 80 min No. of batteries supplied: 2 Wood screws to: 7 mm Max drilling steel: 13mm Max. drilling wood: 38mm Max. drilling masonry: 16mm Chuck capacity: 13mm. 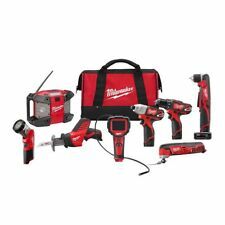 Milwaukee M12FPDXKIT-602X M12 Fuel Compact Percussion Drill Kit 12V. 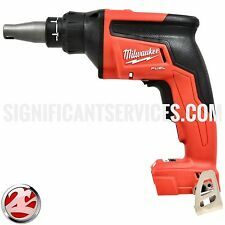 1 x Milwaukee M12FPDXKIT-602X 12v 2x6.0Ah M12 Compact Percussion Drill with Removable Chuck. Flexible battery system: works with all Milwaukee® M12™ batteries. HEARTLAND PAWN LAWRENCE. 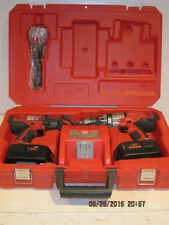 COMBINATION TOOL SET: MILWAUKEE TOOL MODEL 2893-22CX. Tools of all shapes and sizes. Purses and shoes. Heartland Pawnbrokers now with three locations! Things I Buy. M18 BPD Compact Percussion Drill Features HD18AG Cordless 115 mm Angle Grinder Features 3 modes: 'rotary', 'screwdriving' & 'percussion'. HD18AG - Cordless Angle Grinder. M18BPD - Compact Percussion Drill. Due to a specially designed removable chuck and swappable heads, Milwaukee's M12 BDDXKIT-202C performs 4 functions: drilling, driving, right angle drilling and offset driving. 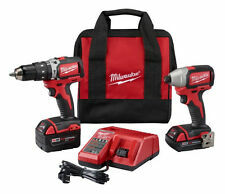 Milwaukee Interchangeable Drill Driver System M12 BDDXKIT-202C 4-in-1. 1 IMPACT DRILL M18 FUEL BRUSHLESS ONE KEY. 2 M18 XC 5.0 BATTERIES. EXCELLENT CONDITION. THIS SALE IS FOR A MILWAUKEE 0824-24P SET THAT HAS BEEN MODIFIED AND REFURBISHED. THE TECHNICIAN THAT DID THE REFURBISHING WORKED FOR MILWAUKEE FOR 15 YEARS AND IS NOW FREELANCING,WE ONLY USE O.E.M. GENUINE MILWAUKEE PART(S) NO CHEAP GENERICS. The 2893-22CXP M18 2-Tool Combo Kit includes the 1/2 in. Hex Compact Brushless Impact Driver (2850-20). of torque. The M18 1/4 in. Compact design. The 2798-22CT M18 2-Tool Combo Kit includes the 1/2 Compact Brushless Drill Driver (2701-20) and the 1/4 Hex Brushless Impact Driver (2750-20). This kit includes (2) REDLITHIUM 2.0 battery, which is compact and light weight, ideal for fastening applications.